The idea is that you build and deploy the new system side-by-side to the existing legacy system and route traffic between them accordingly. Gradually, the new system will grow while the legacy system will shrink as functionality gets re-written in the new system and eventually, the legacy system will go away and the new one will take over. All through this process, users have no idea that the entire system has been replaced while still remaining operational. Ever since reading about this pattern I had been thinking of trying it out in some way but wasn’t sure how so I decided to use IIS and the URL Rewrite module to do simple path based URL re-writing to distribute traffic between the legacy and new application, effectively turning IIS into a reverse proxy (IIS already works as a reverse proxy to Kestrel for ASP.NET Core apps). 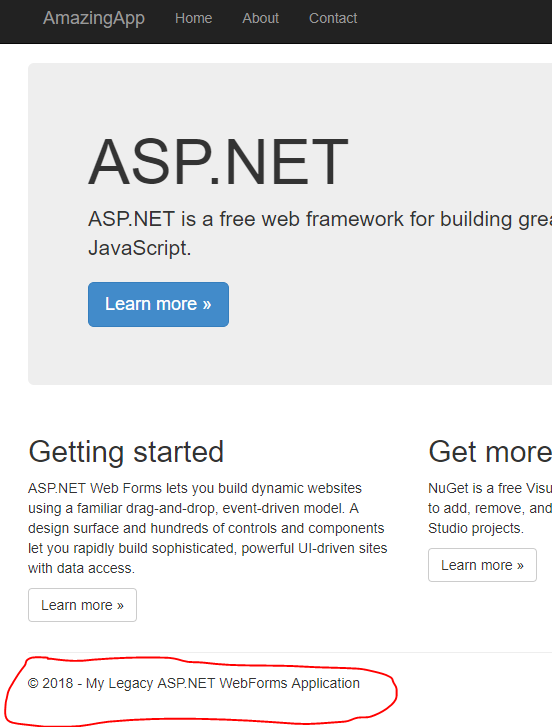 To simulate the applications I created a dummy ASP.NET WebForms project which will play the legacy application role and a new ASP.NET Core 2.0 MVC project which will play the new application role, in Visual Studio 2017. Disclaimer: this may not be, infact, I am certain it’s not, the most efficient or the best way to implement strangler pattern but I think it demonstrates the idea at its very core and I am certainly open to ideas to make this design scale better because this is still an ongoing study for me. 🙂 I am also assuming the readers are fairly comfortable with IIS, URL Rewrite module and Regular Expressions. To simulate migration, I decided to serve the Contact page from the new app and the rest from the legacy app. This means all the other links in the legacy app will use legacy resources but the Contact link will be re-routed to the new app and the response will be rendered as though it was being served by the legacy app. I made sure all the navigation layout and naming is consistent across both apps which is crucial for the stealth of the migration. It would be ignored as ASP.NET routing seems to take precedence and navigates to the route registered during Application_Start above (this is my theory at this point perhaps someone has a clearer idea?). The URL rewriting module is handler agnostic and rewrites the URL based on configuration and kicks in early on in the pipeline. 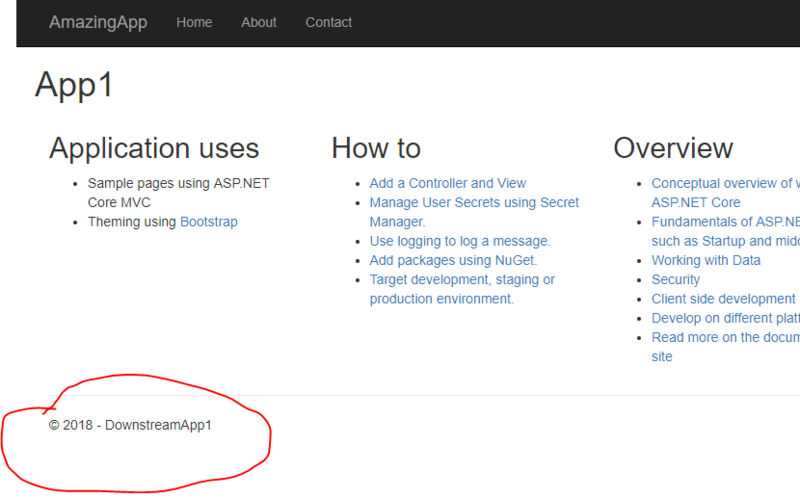 The ASP.NET routing however, kicks in when the application handler (instance of HttpApplication) has been selected to handle the request, it registers the routes in the Application_Start event and proceeds on to make requests to the URL. You can check out this Microsoft link for more information on this. One way to solve this issue would have been to simply disable friendly url settings for urls that I wanted to rewrite (by commenting the code out and manually re-jigging all links) but that would’ve required a bit of work in the app specifically for migration reasons and I wanted to avoid that as far as possible. I wanted to make strangulation changes on the outside relying more on a rules based proxying rather than code level changes. Therefore a more approach I settled for was to put the inbound rules on the server level in the applicationHost.config file (found in C:\Windows\System32\inetsrv\config). Something of note here, since this rule is set up at server level, it gets activated for every single request to the server even to other apps on the server. To prevent this, I added a SERVER_PORT condition to make sure it redirects requests only when made by the legacy app i.e. the one on port 88. This was only half the work as now the redirection worked but any links inside that page were still relative to the new app and navigating to those links was causing a 404. Any third party CSS/JS content (like Bootstrap, jQuery etc) should ideally be served via a CDN rather than from the app root this will keep the number of re-write operations required low. The rules above only rewrote custom CSS/JS content links this made sure that the new app page rendered with its own CSS/JS without disturbing any in the legacy app which were not changed. Voila! form post redirect now works! a) How would I flow the authentication cookies from the legacy app to the new app without having to authenticate twice? Security is an important consideration in this kind of architecture. b) The finer details like re-writing URLs for AJAX calls and caching of responses at the proxy level etc. b) How would I do rate-limiting? This is kind of venturing into application gateway territory that is usually put in front of back end services in a micro-services architecture but could still be useful here. This was the max RPS at this configuration. I got 400 more RPS accessing the new app directly. A difference of around 400 RPS which on localhost doesn’t mean much, plus the result is only static text but the question is would we rather have the users experience a slightly degraded app performance while the migration happens but still be able to provide value out of both the systems or we maintain both applications but the new app doesn’t get deployed and used until ready which means a slower feedback loop and chances of getting it wrong. Slow but likely right or fast but potentially wrong? Perhaps there is a happy medium here that could be achieved if this design was tweaked a bit. d) I also need to figure out how this architecture would work in cloud environment. Perhaps an exercise for the next post.